Scores of Iranian Arabs staged anti-government protest rallies in western Khuzestan Province after the Islamic Republic of Iran Broadcasting (IRIB) excluded the Arab community’s cultural identity in a New Year TV show that was ironically supposed to showcase Iran’s diversity. The protesters called the program aired on the state-run TV “insulting” and demanded an apology from the IRIB. A video published on the BBC Persian website shows anti-riot police surrounded by protesters who were chanting slogans in support of their cultural heritage. According to unofficial reports, protesters also clashed with the police and a number of protestors have been arrested. Some reports also claim that the security forces also fired in air and used tear gas to disperse the protesters. The Ahwaz Human Rights organization said the security forces suppressed the peaceful protest but did not cause any injuries to the protesters. According to the organization, thousands of Arab Iranians gathered in Ahvaz, the capital of Khuzestan, to voice their anger at state-sanctioned discriminatory policies and behaviors towards their community. The Ahwaz Human Rights Organization mentioned that "these programs and other racist practices are part of the policies adopted by the Iranian central government in its attempt to change the demographic structure by deporting indigenous Arab Ahvazi people from their land through policies of poverty, marginalization, exclusion, unemployment, and deprivation." Comment: Popular discontent is growing in Iran’s energy-rich Khuzestan Province for several reasons. Although the province accounts for a vast majority of Iran’s oil production and government revenues, its residents, particularly the Arab community, have been subjected to economic, social and political marginalization for decades. 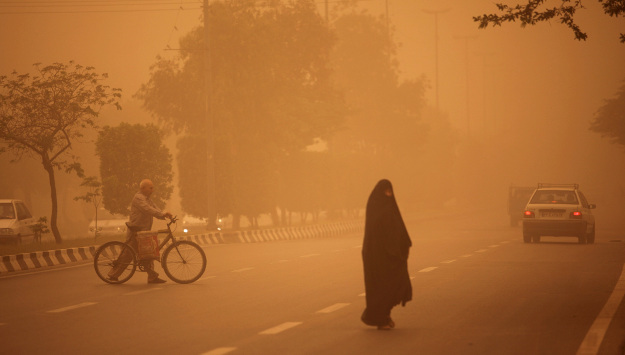 This year, residents in Ahvaz and other cities have also staged rallies to pressure the government to address worsening environmental problems in the region. Protesters have blasted the regime’s expensive wars in neighboring countries at the expense of paying attention to their problems at home. Government authorities, however, have often responded to protesters’ demands with a campaign of intimidation and arrests. But what makes the latest protest movement different is that the Arab protesters are angry about state institutions overlooking the Arab community’s cultural heritage. In the videos, protesters were chanting slogans vowing to protect their cultural identity. It is possible that the TV program mistakenly omitted the Iranian Arabs, but few members of the Arab community would believe that because they see a pattern in discriminatory policies by the government toward them. Although non-Persian ethnic minorities make up nearly half of Iran’s population, their sociopolitical conditions in Iran and state-sanctioned discriminatory policies against them rarely make headlines in the Western press. While Supreme Leader Ali Khamenei often derides the treatment of ethnic minorities in the United States, he turns a blind eye to the plight of ethnic and religious minorities at home.